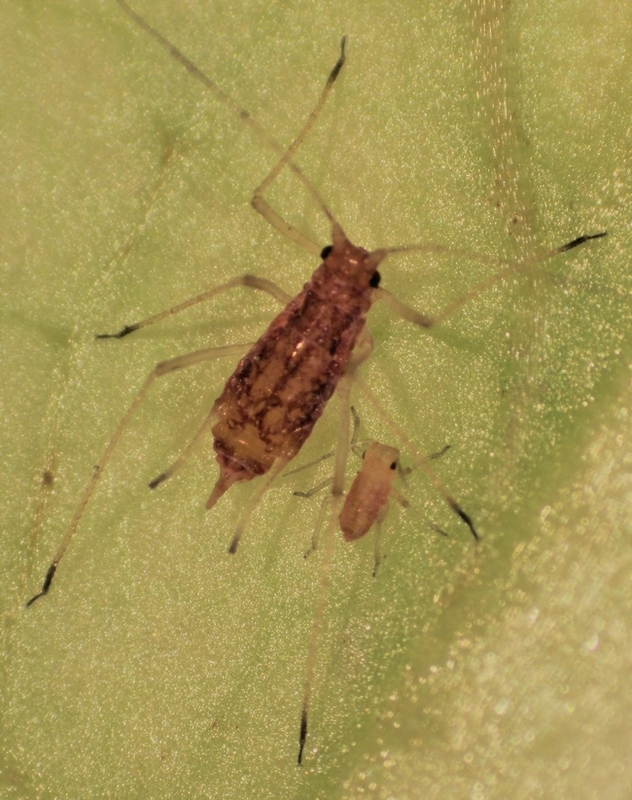 I have been receiving phone calls about the presence of “red aphids” in organic romaine lettuce that is resistant to the lettuce aphid, Nasonovia ribis-nigri (Hemiptera: Aphididae, Fig. 1). The lettuce aphid is considered a difficult pest to manage. This aphid can be green as well as red, and will be usually found in large colonies inside the heart of the lettuce head. Being inside the lettuce head protects these aphids from predators and parasitoids; and their presence is considered a contaminant when heads are harvested. Fig. 1. The lettuce aphid, Nasonovia ribis-nigri. However, none of the samples that were submitted to the UC Cooperative Extension diagnostic laboratory were identified as the lettuce aphid. What are those “red aphids”? First of all, aphids could have different color morphs within the same species. Therefore, relying only on color to identify aphids is not the ideal character to tell apart these pest species. Submitted “red” aphid samples were identified as either: 1) the potato aphid, Macrosiphum euphorbiae, and 2) the foxglove aphid, Aulacorthum solani. 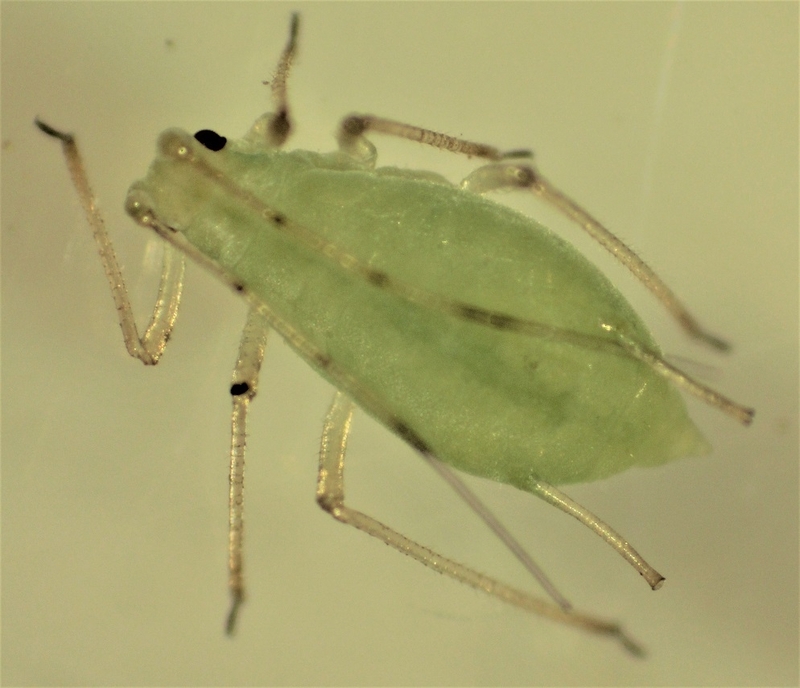 Potato aphid has both the green and the red color morphs (Fig. 2). On the other hand, the foxglove aphid is usually green (Fig. 3); but infections of a naturally occurring Entomophthora fungus will make the specimens look like reddish. This sort of red coloration is due to the sporulation of the fungus from the dead aphid stuck on the leaves (Fig. 4). Fig. 2. The potato aphid, Macrosiphum euphorbiae, red morph. Fig. 3. The foxglove aphid, Aulacorthum solani. Fig. 4. 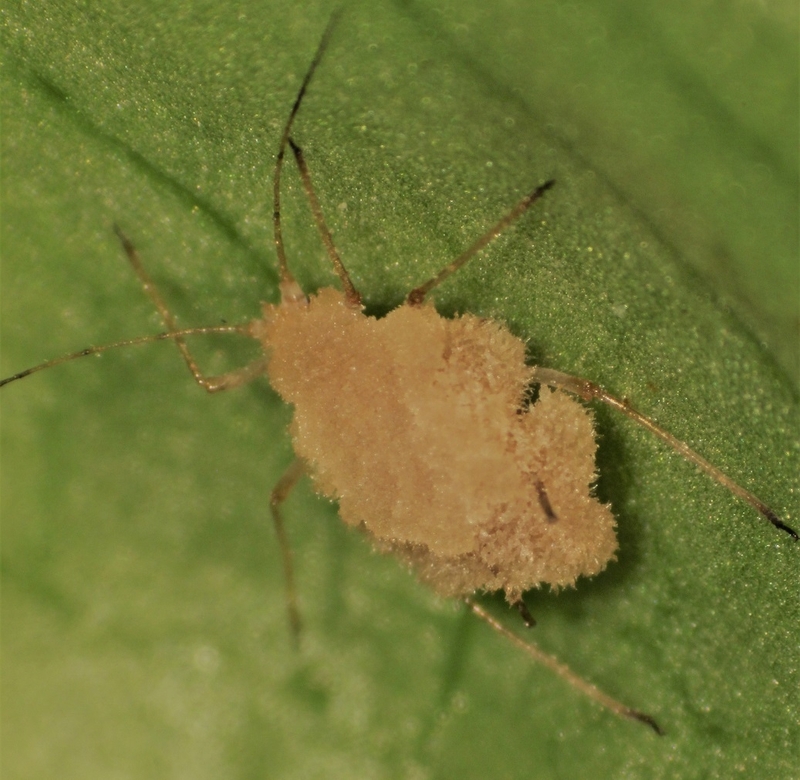 Foxglove aphid infected by an Entomophthora fungus. If you are managing organic lettuce with resistance to the lettuce aphid and you find red aphids, it is important to consider other features beside color. 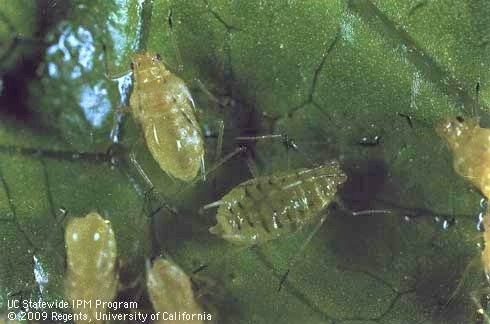 Additional information on how to identify aphid species infesting lettuce can be found at http://ipm.ucanr.edu/PMG/selectnewpest.lettuce.html. If you would like to have a second opinion on your identification, you can always call and/or send your sample to the UC Cooperative Extension office in Salinas.